As one of the nation’s largest providers of integrated solid waste services, APTIM has a strong understanding of market trends and national, state, and local regulations. In addition, our extensive resources and decades of experience designing solid waste facilities, including landfills, constructing, and operating landfill gas (LFG) systems and transfer stations makes us a leading choice for clients seeking solutions for their solid waste needs. APTIM provides a single point of responsibility for engineering, design-build construction, equipment fabrication, operations, and maintenance of a variety of environmental control and energy recovery systems, solid waste facilities, and LFG and leachate systems. APTIM provides comprehensive solid waste planning, procurement, site investigations, studies and evaluations, and public involvement services. APTIM provides hydrogeological investigations & assessment, air quality permitting, modeling & NSPS/EG/NESHAP compliance reporting and audits, data management & reporting, due diligence, and health & safety support services. We offer, landfill cell & closure design, LFG well drilling and collection/flare systems installation, construction quality assurance (CQA) & certification, groundwater & LFG monitoring systems, organics management, transfer station, materials recovery, & hauling facilities, waste to energy and Coal Combustion Residual (CCR) facilities. Through our LFG Specialties Division, APTIM offers design & fabrication of landfill gas flaring systems, low emission flres, systems, leachate evaporation system (E-Vap®), fuel delivery & conditioning equipment, American Plastic Pipe and Supply offers HDPE and PVC solutions for landfillls, leachate, and landfill gas collection. APTIM’s proprietary E-Vap® technology essentially eliminates two major landfill problems simultaneously. Fueled by methane gas provided by the landfill, an E-Vap® unit evaporates over 90 percent of the volume of leachate processed. APTIM can provide turnkey systems for owner operations or will finance with no owner capital under a 10-year Leachate Management Services Agreement (LMSA). 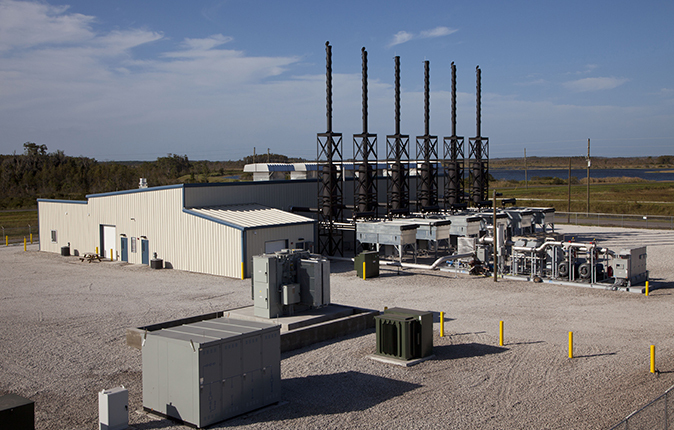 APTIM provides complete design-build, O&M, and owner/operator services to support LFGTE project development. Over the past 20 years, we have developed and been the owner/operator for over 20 beneficial use projects with energy customers ranging from industrial boilers, leachate evaporation, electric generation, and high Btu gas operations. We provide O&M services at over 100 solid waste facilities including LFG systems for compliance and energy recovery, groundwater, and on-site leachate treatment. We can perform landfill end-use planning/redevelopment, LFG recovery projects, cap design & closure documentation, post-closure maintenance, monitoring & reporting, and CCR facilities. We have worked on more than 40 successful landfill redevelopment projects, including multi-story office buildings, retail complexes, and such recreational end uses as golf courses, athletic complexes, and parks.